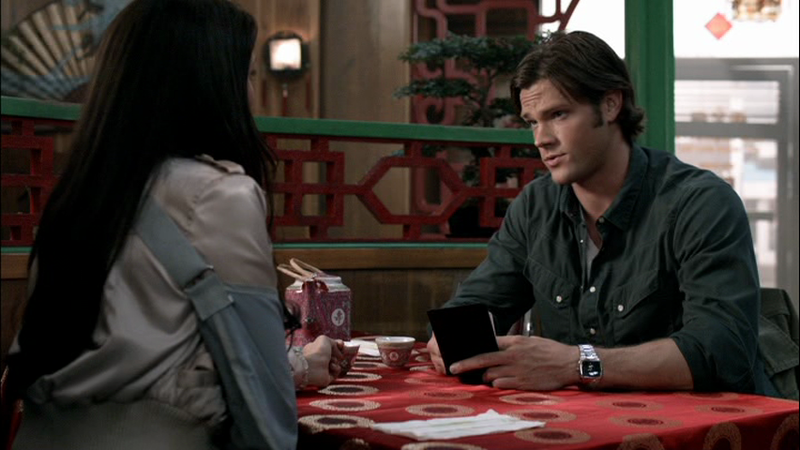 It’s actually fairly rare for Sam to wear solid colour shirts - especially solid colour GREEN shirts - that’s more Dean’s thing. That being said, this shirt enters the collection in S4. It’s a green shirt with white snaps. The most unique thing about it is that the breast pocket flaps sit on an angle, with the their snaps to the side of the pocket rather than in the middle. In Wishful Thinking (4x08), Sam is wearing this shirt upon arrival in Concrete, WA. He wears it until he and Dean figure out that Wes was the original wisher, and then changes before they go to see him. In Free To Be You And Me (5x03), Sam is wearing this shirt upon arrival in Garber, OK. He wears it as he burns his IDs and when he sees the Help Wanted sign at the bar. In Mannequin 3: The Reckoning (6x14), Sam wears this shirt at the very end of the episode while Dean fixes the Impala at Bobby’s. In Meet the New Boss (7x01), I believe this is the shirt Sam is wearing while he and Dean work on the Impala and listen to a radio report about Cas killing motivational speakers.